One of the first things toddlers become fascinated about are things that they can see, touch, and feel. Once their interest catches up, they start to explore and learn. Books like Colors With Ladybug can help kids explore their visual and tactile senses combined with engaging storytelling. The Colors With Ladybug is a child’s book that contain colorful pages and visual treats. Not only that, each page also comes with a number of different textures that the kids can explore as they turn each one. Parents can help guide the kids as they explore page after page acting as the storyteller, guiding the young ones on what to do. Exploring the book becomes a wonderful early interactive learning experience for the kids. 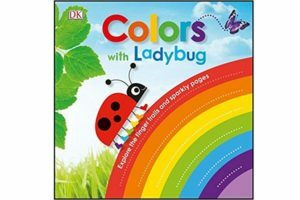 The Colors With Ladybug book teaches kids about the colors of the rainbow accompanied by sparkles and textures that they can feel with their hands on each page. This book helps encourage kids to learn more about colors, textures, and help develop their early language skills. The book is ideal for kids as early as a year old. It is available at Fat Brain Toys for around $10.